The Mean Green has arrived! Now added to the Marvel© marvels lately adorning our screens (which already include the boyish charms of Tobey Maguire's Peter Parker and nebulous shadowland of Ben Affleck's Matt Murdock (in a visionless vehicle more or less saved by Colin Farrell's Bullseye) is the enticing and alluring entrance of Eric Bana's Bruce Banner. Look at those puppy-dog eyes! It seems to be just what the director ordered. The shy, unassuming, big Australian boy has a quality that makes him immediately likeable. (Will Bruce, we ask, ever get his Sheila?) Even when he bursts his shirts and slams his fists on the table, the uncomprehending gaze and gentle child-like stance of a hopeless, helpless innocent shine through the giant's overwhelming power. It seems so clear that he doesn't understand why people are doing the terrible things they do or how the world could possibly be under the control of such terrible forces. So he mashes them. It's that incredible innocence that holds the secret to Ang Lee's interpretation of the tale. Instead of the fierce and fighting monster one can remember from the comics or the demented and distracted body-builder one saw in the second-rate (albeit extremely popular) TV series from the late 70's, we here have a tale to which people can relate as they watch a guy who suddenly seems trapped in circumstances way beyond his control. The only one who is constantly prepared to trust him and offer a running start is love interest Betty Ross (Jennifer Connelly). She seems to understand him (and so she ultimately proves that size doesn't matter). Of course, there's also villain Glenn Talbot (Josh Lucas) lurking in the passages. He embodies a Roswellian type who regards himself as the ruthless left-arm of perverted righteousness. He also happens to have one sinister eye cast toward the attractive Betty, who, in turn, is the daughter of General Ross (Sam Elliot). We can easily empathize with the Green as he stands before us, arms hanging limply at his side, body balancing under a burdened mass of muscle, reminding us of a little boy lost. After all, it wasn't his fault that such terrible events have unleashed his terrible power. His father, David Banner (Nick Nolte), began the process many years earlier and now this eternally obsessed figure unfortunately enters Bruce's life once again while slumming around shortly after the film begins. When you've been a prime testing ground for your own father's experimental program, it's bad enough, but when shifting green patches on your skin start to change into full-blown green as the result of a laboratory disaster, things really begin to get out of hand. And so it goes: what initially resembles the hangover from hell, followed by symptoms of illness and incidental blackouts, winds up revealing itself in a gigantic multiple-personality disorder. Not only is this problem huge, but it's green. Not his fault. Paternal scientist David (Nick Nolte), it seems, wasn't able to keep his hands off his youthful offspring and started injecting him with the same experimental serum he used on himself. Result: the son eventually develops big problems that deviate far from the usual course. Poor little Bruce just doesn't have control over himself anymore. When this boy blows up, it goes far beyond Ferrignoville and into the land of Big Bad Toon. Marvelously, the method of evolution manages to fuse the reality (?) and sentimentality of this modern version with the lingering images of the original comic-strip hero and creates a truly fascinating screen experience. One remains in awe of the creature who can both bounce across vast mountain ranges with the ease and grace of a deer while not damaging the ecology too extensively, while, on the other hand, frequently leaving an indelible print upon the urban surroundings where he meets opposing forces. This may, indeed, be a person one might prefer not to make angry, but one has to admit this creature has a sense of style. Once again, thanks are due to the legendary Stan Lee of Marvel comics, who gave us The Hulk (along with many other figures) and to Jack Kirby as original illustrator who designed the Hulk comic strip. Stan himself says, "When I was younger, I loved the movie Frankenstein, starring Boris Karloff as the monster, and I also loved Dr. Jekyll and Mr. Hyde. One day, I figured, 'Boy, wouldn't it be cool to combine the two of them and get a character who can change from a normal human into the monster?' I always felt that in the movie Frankenstein, the monster was really a good guy. He didn't want to hurt anybody, he was just always being chased by those idiots holding torches and running up and down the hills. So I thought, why not get a sympathetic monster, but let it be a guy who can change back and forth? So, the Hulk became the first Super Hero who was also a monster." Producer Gale Anne Hurd had worked previously on projects such as "Terminator 2: Judgment Day" and "The Abyss" with visual effects supervisor Dennis Muren and knew that he was the right man to lead the Industrial Light and Magic team toward the realm of the Green Giant. Further enhanced by the steady and apt leadership and support of special effects supervisor Michael Lantieri, Bruce Banner has now evolved into the monster he was always destined to become. Before appearing on the big screen, this project's animated title star logged two-and-a-half-million computer hours and six-terabytes of data during a year and a half journey. Will Betty be a Banner or will Bruce pursue more trouble? Can he run away forever and control his blasting temper? You can blame his screwed up father for the f**k-up in his genes, but poor Bruce still suffers with no hope of a solution cause he hasn't found the manner and he hasn't got the means. Poor Brucie. 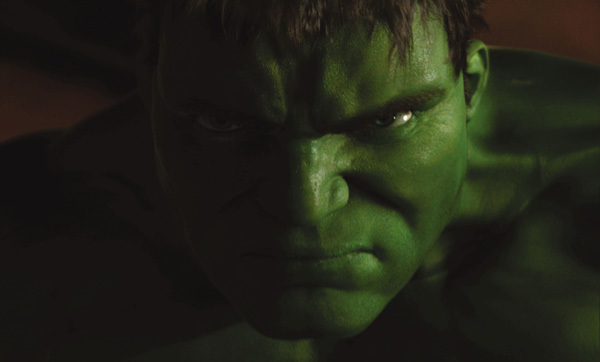 That gamma radiation can sure wreak havoc with your rage. Anger and strength can be quite a combination when righteousness is sought in a world devoid of ethics; if only Bruce could manage to harness his companion's power, he might have a chance of really changing the world for the better. Stay Green, in the jungle or wherever!